Step 5: Compiling and sending to your Particle board. This tutorial will introduce you to the basics of reading values from a TMP36 Temperature Sensor. The TMP36 looks virtually identical to the NPN Transistor provided in the kits. Be sure not to confuse them - to make sure you have the right one, check the top right corner of the flat face. A capacitor will try to keep the voltage in a circuit constant when there are changing currents. It conducts these changes to ground (GND). In this case we will use it to ‘filter’ and smooth the voltage from our temperature sensor so we get clean, consistent and good readings from it. 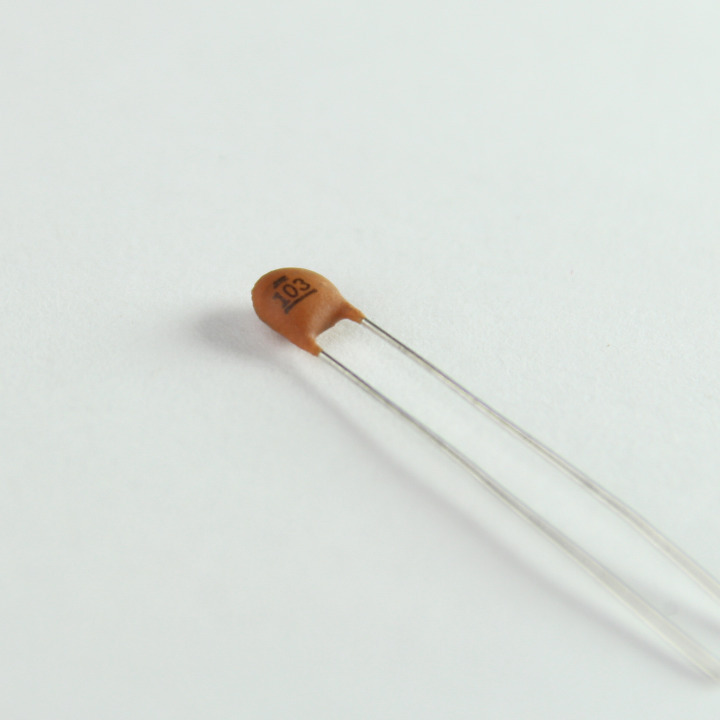 To keep the readings free of noise, we will add add a 0.01uF (10nF) ceramic capacitor. The image shows the standard ceramic capacitors you have in your kit. 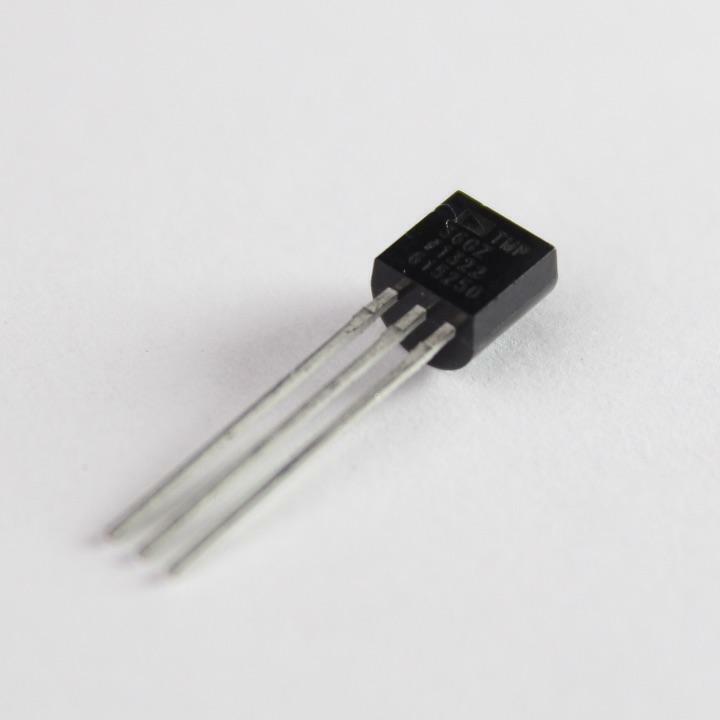 They are widely used in analog circuits as bypass/ decoupling capacitors, in timers, filters, etc. Note: These are non-polar capacitors which means they can be oriented both ways. The TMP36 Sensor must be correctly wired or you will permanently damage the chip. This is a little different from the photo resistor and FSR. The TMP36 and other three terminal sensors don’t act like a resistor, so we need to connect them a little differently. The program starts by declaring that the temperature sensor will be connected on pin A0 and that we will use two double (decimal type) variables to store the celcius and farenheit temperature readings. The setup() links these two variables to a Particle Cloud variable and indicates that they are of type DOUBLE too. Finally, it specifics that the pin at A0 will be used for Input. Each time the loop function is called it first reads the value from our sensor and stores it in an integer variable. This will give us a number between 0 and 4095. This number isn’t super useful yet so we’ll want to convert it into something more familiar, an actual temperature! To do this, we calculate the original voltage. We take the sensor reading and knowing its connected to the 3v3* pin we multiply accordingly. Then we convert this by dividing by the maximum of the range. This gives us a decimal value to work with. We store the celsius range in the variable named temperature, quickly convert to fahrenheit, and we’re done!